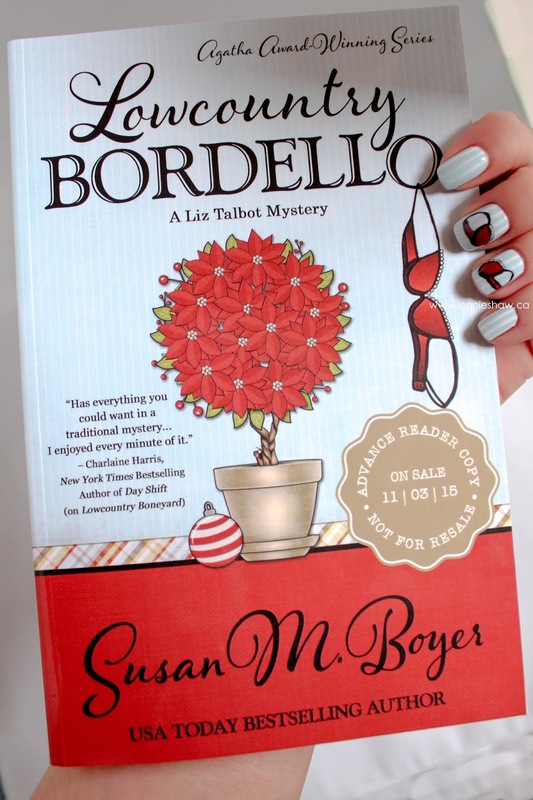 Today, I'm delighted to be a part of Susan M. Boyer's virtual book tour, for her latest instalment in the Liz Talbot Mystery Series: LOWCOUNTRY BORDELLO! This post is a little on the long side, but that's because I've got a review AND an interview! I know, it's a lot of excitement for a Monday morning. Haha! The fourth in the Liz Talbot mystery series, LOWCOUNTRY BORDELLO has Liz poking around an unexpected location. 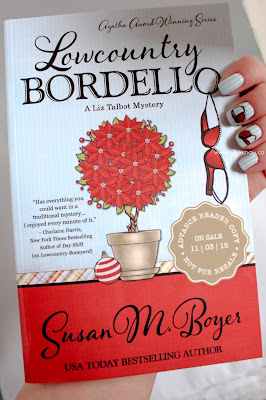 Namely, a bordello (as I’m sure you savvy readers already picked up, ha!). But Liz has more than her case to juggle, because she’s getting married! Not that she seems to care much for the actual wedding, but that's what I like about Liz. I mean, it’s not like Liz is anti-wedding…okay, she actually kind of is, but her reasonings come from a good place. I like to think it's because this time, she's more excited about the lifetime that comes after the big day, rather than the big day, itself. And frankly, with the wedding planner Liz's mother commandeered, I would've been hiding out in a bed and breakfast too. Under the guise of her case, of course. But to keep it real, what sounds like more fun: getting your wedding dress tailored or figuring out a possible murder? Haha! Yes, I mean possible murder, as the book starts out with a frantic call to Liz regarding a dead body that may or may not, in fact, exist. And it’s those sorts of details that make the series so strong. Why have a straightforward murder plot, when you can have a murder plot laced with questions regarding whether the murder actually took place? Ha! When I saw that the cover had a bra, I was all: MUST DO TRIBUTE MANI. Haha! So that's what I did. The lace bits were tricky, but for the most part, I think the whole thing turned out pretty well! As I’ve come to expect from the series, there were lots of suspects, so Liz and her partner Nate had to work pretty hard to figure out what really happened. None of the suspects were particularly trustworthy, and I enjoyed Liz’s process of sussing out the truth in the midst of wedding-planning mania. I did have one concern with LOWCOUNTRY BORDELLO, though, and that had to do with the overall tone. Throughout the first three books, I got to know Liz as an even-tempered, non-judgemental character, but that wasn’t the case here. Although Liz protested that she “couldn’t care less” that her case took place in a bordello (and I’m still not sure that it was a bordello in the first place), she made more than a handful of snide remarks about the women who lived in the house. Each time, I was irked enough to be pulled from the story, which was both distracting and disappointing. Had those moments not been included, I would have enjoyed this book more. Even so, it was a nice cozy, and I’ll continue to pick up new books in the series. Okay, so now that you've read my two cents about LOWCOUNTRY BORDELLO, now it's time for the interview! Hi Susan! I’m such a fan of the Liz Talbot series, so thank you very much for agreeing to a little Q and A on my blog. I’m thrilled to have you! Thank you so much for having me! I’m thrilled to be here! And thank you for reading—I’m so happy you enjoy spending time with Liz. 1. Every writer’s process is different. Some are pantsers, some are plotters, and some are drinkers. Kidding! Sort of. I think it’s common knowledge that Hemingway was a bit of a drinker, but I digress. 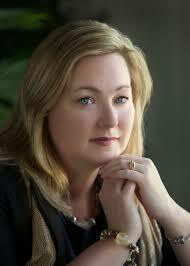 As you’ve now written four Liz Talbot mysteries, has your writing process changed? I started out as a plotter, and I’m still a plotter, but I have refined the process quite a bit. I use a spreadsheet, with one line for each chapter of the book, and the plot point that’s delivered in that chapter. Once I start writing, I often change things—my characters may take me in a different direction. I can always modify the spreadsheet. 2. Your descriptions of private investigator work are always incredibly detailed. That level of background detail on suspects, locations, and other information related to the case, disguise the relevant information until the very end, when I say: “Oh yeah! That’s from that one scene that I thought was about kissing but it was actually a plot hint!” How do you organize all of those thoughts? And have you ever described a peripheral character who ended up standing out, demanding a larger role because of their vivid descriptions? Thank you! I researched how to be a private investigator like I wanted to be one. I actually did. As a child I wanted to be Nancy Drew. I digress—apologies! The spreadsheet is the key to organizing my thoughts, for sure. Absolutely, once my characters are developed, they have minds of their own. 3. One of the characteristics of Liz that I like most is that she’s not an “accidental” private investigator. There aren’t a series of too-convenient coincidences that lead her towards the truth. That girl works for her leads, in a delightfully old-school way. Yes, she uses technology, but she also understands the personal touch. It reminds me of the mysteries I used to steal from my dad’s pile by his bed, so I’m wondering if you were at all inspired by other, traditional mysteries. Thank you! Liz will appreciate that you recognize I make her work hard for the money. Have you seen what she charges? She needs to work hard. I’ve loved mysteries for as long as I can remember, staring with Nancy Drew and Trixie Beldon. I graduated to Agatha Christie and many others. I’ve read most of John D. MacDonald’s Travis McGee series. I’m a huge Sue Grafton fan, and I love Robert B. Parker’s books. 4. I have a few friends who have recently become published authors themselves (shout-out to Scott!). The after-publication responsibilities of balancing writing, promotion, marketing, and social media seems like a never-ending struggle. How do you manage all the moving pieces required for author life? It’s a constant balancing act, and truthfully, I don’t have the act down cold just yet. I just try every day to do the best I can, then try not to fret too much about what I haven’t finished at the end of the day. 5. What does your perfect writing day look like, and where would you be? Would there be snacks? (Haha! Of course there would be snacks. I’m really asking what kind of snacks you’d have.) A pair of kittens playing at your feet? Would you be lounging in a blue velvet wingback chair? Dictating to a hunky assistant who’s continually too hot to wear a shirt, has a vocabulary that rivals a thesaurus, and is at the ready to give you a high-five after inspiration strikes? * I would be in a cottage by the ocean on a quiet stretch of beach, with my office overlooking the waves. I like to write with my laptop on a lap-desk from a chaise or recliner. I’d need good coffee in the morning, then iced peach tea until around three when I switch to decaf. Having easy meals in the refrigerator would be heaven. Nothing fancy, just grab and go. And something salty—popcorn would be great—and Lindor milk chocolate truffles. 6. In LOWCOUNTRY BORDELLO, Liz curls up with a Harlan Coben novel. I am a super fan of Harlan Coben, so I’m dying to know if you had a specific book in mind. THE STRANGER? HOLD ME? Oooo! Was it BACKSPIN? I freaking love the Myron Bolitar mysteries. I LOVE Harlan Coben novels! I had the one in mind that I was personally reading at the time, which would’ve been Six Years, I think. My favorite (I think) is Tell No One. Thanks so much for answering my rambly questions, Susan! And for including me on your tour! My pleasure—thank you! So now that you know all about the Liz Talbot series AND you've met the author, all that's left is to enter for your chance to win a $50 Amazon gift card! Good luck! And don't forget to check out Susan M. Boyer's other books! Links to all her social media accounts are posted below the Rafflecopter giveaway. Ummmmm...that manicure rocks!! So cool! 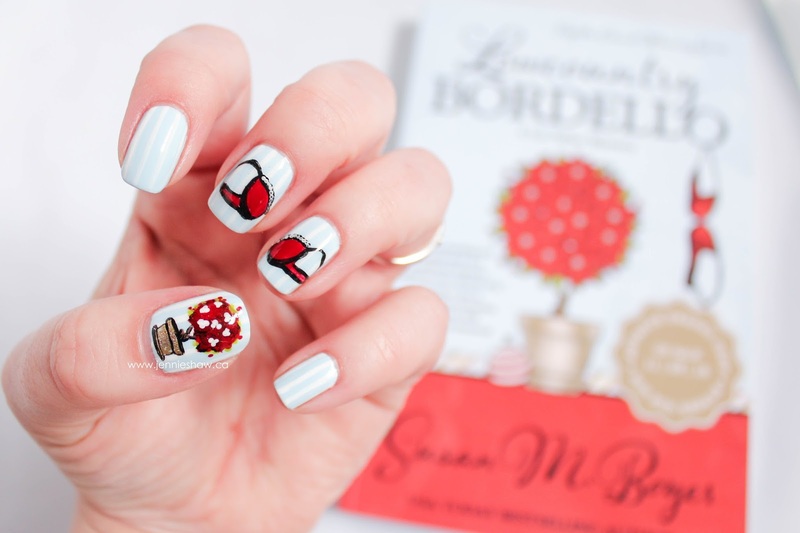 Love that manicure!! Thank you so much for hosting and sharing your thoughts! This sounds like a fun one (although snide remarks about women in the bordello would irk me, too). I love when a mystery is good enough that you don't figure it out by halfway through the book. And I love your tribute mani! As soon as she said "spreadsheet", it was like a lightbulb. What a great way to plot our plot points and reveals! I love it. I'm stealing it....er, whenever I get around to writing.